Last week I spoke to an eager group of business owners and marketers on inbound marketing. I asked each of the attendees to write down 3 inbound marketing questions before the class started, 3 midway through and 3 at the end of class. This not only allowed me to know some of the common questions business owners have about inbound, but it also got them to understand the buyer's journey a bit better. The more they were educated throughout the class, the more their questions changed and became more specific. From the exercise, here are 3 of my favorite inbound marketing questions asked by the attendees. How can we educate consumers without overwhelming them? This was a question that was asked prior to the class even starting. I like this question because of the understanding that consumers want to become educated when trying to make a decision. When consumers are making informed decisions because they are doing the appropriate research online, they are learning so much without even feeling like they are being "taught". They will be so much more engaged with education based content vs sales pitches. As long as you are truly providing education and value to your consumers, it is very difficult to overwhelm them. They can consume the content at their own pace and gather as much information as they are comfortable with. A business successfully implementing inbound marketing will make their consumers aware that they are there for support if they are feeling overwhelmed. Make yourself available on social media, via email, and phone. Whether you like it or not, customer service will be an aspect of inbound marketing. How do we create content marketing offers without focusing on sales, but instead on education? I like this question because many businesses struggle with this aspect when writing content. Even with the full intent on education, they try to push sales at some point. It's like they don't feel right writing something "for" their brand without selling their brand. Be sincere with your education marketing content. Think about the problems that your potential consumers have. These problems would be in the very early stages before the consumer would even consider your product or service...heck, they may not even know they have the problem yet. Provide information educating about that problem itself, not about your brand or why you can solve it. How can we be competitive with larger companies using inbound marketing? It's a concern that most small businesses struggle with that inbound marketing can help with. Inbound marketing is the best way for a small business to be competitive with large businesses. As a small business you would never compete in the traditional marketing aspect (tv, billboards, direct mail, etc). They have much bigger budgets which dominates in traditional marketing. Inbound marketing is not all about budget. Inbound is about building relationships with consumers at a level traditional marketing will not do. You are helping and educating people, building trust...a solid foundation for a great relationship. It does not require an unlimited budget to create great content that helps to achieve this. It takes determination, yes, but ANY small business can implement a good inbound strategy! 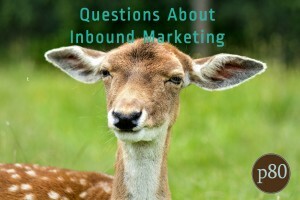 What questions about inbound marketing do you have?